In his book of memoirs, George Clinton writes, “All junkies have rituals.” He describes the way addicts bargain with themselves in an attempt at self-discipline that emphasizes work before play. For Clinton, a wildly colorful character whose most definitive role was as bandleader for the pioneering musical troupe collectively known as Parliament-Funkadelic, work was always important, but his own imbalance of substance over sustenance is what in part led to some bad business decisions and decades of addiction. Snippets of music can be overheard through the phone at the beginning of our conversation. At 74 years old, he’s in his Tallahassee, Florida studio (the city in which he resides) recording tracks and putting vocals on the next Parliament album called “Medicate Fraud Dog,” due in January. In an upbeat but weathered voice, he admits he still smokes weed but that he’s kicked the old habit of smoking crack. A recent resurgence of attention has surrounded funk’s chameleon-like founding forefather, whose penchant for elaborate costume and alter-ego rivals that of his 1970s contemporary, David Bowie. He's been touring solidly for months in promotion of last year's book, “Brothers Be, Yo Like George, Ain’t That Funkin’ Kinda Hard On You?,” which was followed by “Shake The Gate,” the first official Funkadelic album of new material in 33 years. On October 29, Clinton’s P-Funk makes its way to Oakland’s New Parish for a live performance. In the book, he paints a picture of what sounds like typical 1970s music industry decadence, with scenes of Casablanca Records executives, in charge of KISS and Donna Summer (who were his label mates at that time), riding around Los Angeles in their cars with the tops down, ubiquitously wearing coke-spoon necklaces. The addiction and excess both followed and paralleled what is undoubtedly considered a revered musical legacy. Far from his roots as a 1950s barber shop hairdresser at Plainfield, New Jersey’s Silk Palace, Clinton’s doo-wop-singing origins would evolve into something otherworldly over time. By the ‘60s he’d moved to Detroit, where record labels were flourishing. He gained work as a freelance songwriter for Motown, but didn’t produce any hits for Hitsville U.S.A. during his time there. His own group, the original incarnation of The Parliaments (named after cigarettes), was turned down by the label and had run its course. After absorbing Motown’s vibe, Clinton was ready to put together a new project; one that would focus on musicians’ virtuosity rather than vocalists and frontmen, essentially inverting the Motown model. With players like Bernie Worrell on keys, and guitarists Eddie Hazel and Garry Shider onboard, Funkadelic was launched. Around that time, he met another Detroit entrepreneur, Armen Boladian, the founder of Westbound Records who’d later put out Funkadelic’s earliest albums. Boladian to this day owns Bridgeport Music Inc., a source of ire for Clinton in recent years, since the publishing company was awarded copyrights to many of his songs in a lengthy and ongoing legal dispute. Clinton asserts he’s owed millions of dollars stemming from lawyers, record companies and publishers who have “conspired” against him and that some of his songs, including “(Not Just) Knee Deep” are used in the current NWA biopic “Straight Outta Compton,” without compensating him or his songwriters. By the mid-’70s their cosmic-slop alien invasion onslaught was in full swing with blonde wigs, platform boots and Shider in a diaper. They filled a void by creating their own niche that incorporated comical lyrics, sometimes laden with sexual innuendo and other times being overt, but always having perfectly matching album cover artwork. With star bassist Bootsy Collins now in tow, the re-booted Parliament, along with Funkadelic laid down the blueprint for the Mothership, an intricately designed and iconic stage prop, long-slated to make its way into the Smithsonian, from which Clinton would emerge. P-Funk's initial ride lasted until Clinton effectively ended both projects in the early ‘80s when he embarked on a solo career. By then, their heartfelt plea, like a mission from beyond, urging fans to feel the music and to get up and dance had become part of their legacy, solidifying that funk was always stronger than any drug. 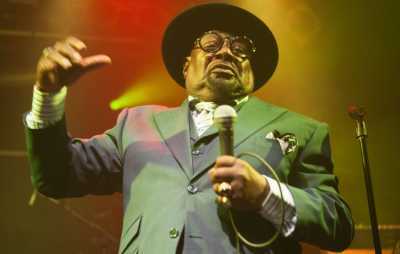 George Clinton and Parliament-Funkadelic will play Oakland's New Parish on Thursday, Oct 29, 2015 9:00 p.m. Tickets here.